Here is where it gets exciting. You use the exact same program you’ve used for registration and building your competition to now run your competition. Connect up additional computers and enter judge mode. Your judges are presented with a simple to use interface that allows them to go forward and backwards as well as jump around competition easily. 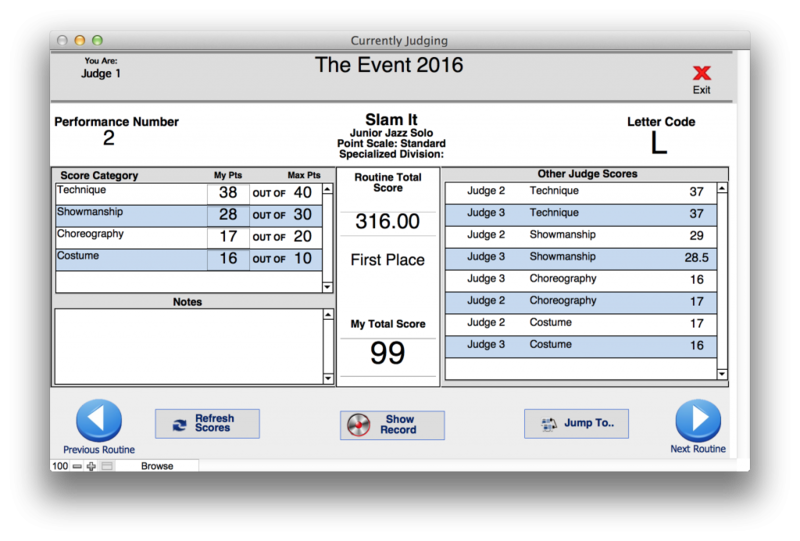 Each judge system has its own list of score criteria to fill in (based on your preferences) and the ability to see what the other judges think. Once all the scores are in, the judges see the immediate placement of that routine. Judges can add notes to routines that will be passed onto directors and teachers and chat with each other to discuss routines, scores or even special awards.